Armco barriers are super efficient in a multitude of industrial applications, preventing the severe damage that can be caused by impact from a moving vehicle. When installing Armco barriers, whether you’re looking for dig in posts or bolt down posts, the type you choose is vitally important. You could choose Armco Z posts, or RSJ posts to support your Armco Barrier system, but, either way, real consideration of the circumstances in which the barriers are being installed must first be given. When Armco barriers are installed, on top of ensuring solid protection of people, buildings, equipment and machinery, thought should be given to what might happen at the moment when the vehicle collides with the barrier. Learn about how crash barriers work here. In addition, it’s necessary to be aware of why you should choose Armco Z Posts or RSJ posts and what the differences are between the two. When a vehicle moving at high speed collides with an Armco barrier and it comes to an abrupt halt, as though hitting a brick wall, this can mean greater severity of impact, greater damage to the vehicle itself and the driver. This sort of situation might occur when a strong, stable and solid RSJ post is in place. Alternatively, the lightweight Z posts collapse on impact, meaning less severity of force. This suggests a completely different outcome. Both the Z section and RSJ section post perform the same function but have two major differences – cost and strength. RSJ posts are the strongest post design and provide a strong stable base for you to attach your system to. These are advised for high risk areas as they take the brunt of the impact and give more protection than that of a ‘Z’ shaped post. When you’re looking to make cost savings, but still want reassuring protection, the Z section is significantly cheaper, especially where there is a larger application. Z posts are sacrificial and lightweight, designed to collapse in a row to take the sting out of an impact. Because they collapse on impact it makes them ideal in lower risk areas, for fast moving vehicles, which might otherwise be completely destroyed when hitting something solid. 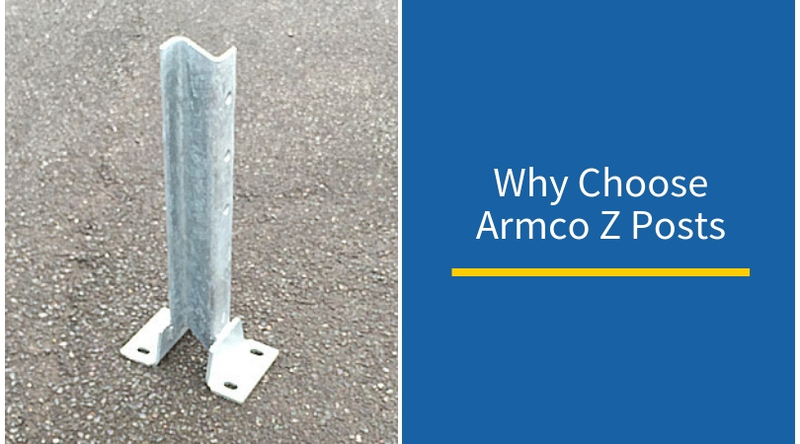 Where Are Armco Z Posts Suitable For? It’s always necessary to make the right choice in the Armco Barrier posts that you choose. In summary, Z posts are weaker posts and designed to collapse on impact and deflect damage from vehicles. RSJ posts are stronger posts and are designed to stop vehicles on impact (low speed). When deploying long runs of impact barrier into a new site, Armco Z posts are the most economical choice. They are great in areas where Armco Barriers are needed more as a visual deterrent or for segregation, than in places where there is a high chance of impact. When Armco barriers are installed, there is strong reassurance that, not only will important buildings, machinery, stock and equipment stay safe, but there will be no confusion as to what can go where. When you’ve made the decision that Armco Z posts are what you need, you can calculate your requirements online using our handy Armco Barrier calculator. And for further information about our Armco Barriers or to place an order, get in touch with a member of our team today.